This program is some of nice program with pure ARP protocol kernel, can cut off funcation. That no one can escape from your cut off unless he have netcut installed or antinetcut on his PC so he can protected. This also easy used program that only one click to protect user function and no one can cut off your network with ARP spoof. This program also effective with one click for cut down any computer on LAN to gateway. 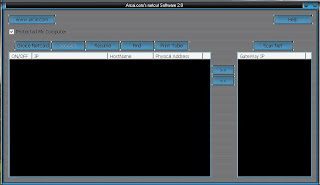 Its also can give all IP addresses on the computer who connect with LAN, work at office LAN and another network. Its safe to use, no one can track out what happened last more stable for switch hub or cable LAN use for Ethernet. This program is know who is using your internet connection and it can also scan TCP connection and who using NetCut. This some solution for someone who attacked with WinArpAttacker or LANAttacker.